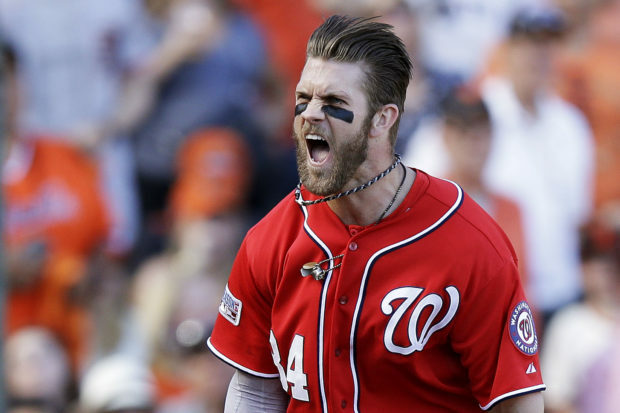 Washington Nationals star outfielder Bryce Harper turned down the team’s reported 10-year, $300 million contract renewal offer, according to multiple reports. The Nats knew that they had to make the 26-year-old a breathtaking offer in order for him to forgo his free-agent eligibility. Harper, however, decided to spurn the team’s offer and test the MLB’s free agency market. Despite the team’s failure to proactively lock Harper up, General Manager Mike Rizzo confirmed that the Nats will continue to pursue their former asset. In the event that Rizzo is unable to reach an agreement with Harper and his agent Scott Boras, the Nationals will likely be starting Juan Soto, Adam Eaton and Victor Robles in the outfield, USA Today reports. Amongst the list of other teams that are expected to pursue the former MVP are the Philadelphia Phillies, San Francisco Giants and St. Louis Cardinals. Through seven seasons in the MLB, Harper is a career .279 hitter with 184 home runs and 521 RBIs. He is a six-time All-Star.